If there is one thing you cannot resist at the holidays, it is the scent of candy canes. Am I right? Who doesn't love peppermint scented things at holiday time. philosophy just happens to have the right thing. A HUGE bottle of their finest shampoo, shower gel & bubble bath. Isn't that comforting? Give the gift of holiday cheer. Candy Cane is here! This fan favorite is back to sweeten things up. The exhilarating scent of peppermint is sure to make spirits bright as the award-winning formula cleanses and conditions from head to toe, leaving skin soft and lightly scented. The award-winning formula is also a multitasker. It leaves skin and hair feeling soft and lightly scented. Gentle enough for everyday use. This would make a wonderful gift to anyone who likes mint shampoo/shower gel. Man or woman. It would make an excellent stocking stuffer. Or as part of a gift set with other products. To use, apply to wet body, hair and scalp. Lather, rinse and repeat. If using as a bubble bath, drizzle a generous amount under running water and enjoy. 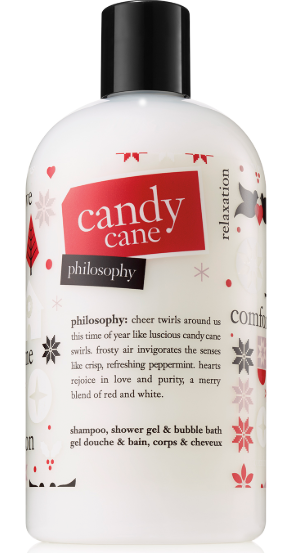 philosophy's candy cane shampoo, shower gel & bubble bath is very nice, It works great as a shampoo, shower gel or a bubble bath. It is a delicate shampoo with light conditioning properties. As a bubble bath it softens skin and leaves a light peppermint scent. As a shower gel it cleans skin and leaves a nice peppermint scent but doesn't dry out the skin. candy cane shampoo, shower gel & bubble bath is a special holiday item on www.philosophy.com. It might also be available at philosophy counters too. Like philosophy on Facebook: https://www.facebook.com/philosophy; Follow philosophy on Twitter: @lovephilosophy; Follow philosophy on Pinterest: https://www.pinterest.com/lovephilosophy/; Follow philosophy on Instagram: https://www.instagram.com/lovephilosophy/ and Subscribe to philosophy on YouTube: https://www.youtube.com/philosophy.